Mucinex (aka guaifenesin) is an over-the-counter medication that is often used to treat cough and other symptoms of upper respiratory illnesses (URI). However, this medication unfortunately is also often used to treat other symptoms inappropriately. It works ideally in a well-hydrated body and as such, mucinex should be taken while drinking plenty of water. 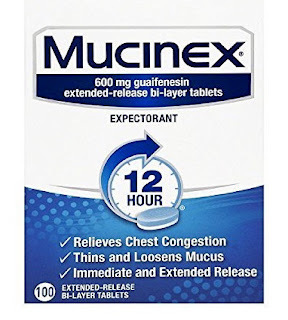 Mucinex essentially is taken to specifically help cough up thick and sticky mucus in the lung and throat, especially in patients suffering from bronchitis. It may be helpful to help blow thick and sticky mucus from the nose as well. However, Mucinex is often taken for many other symptoms that I personally feel provides little if any benefit. Here are a few symptoms for which Mucinex should NOT be taken, but is often incorrectly taken by patients (my own personal opinion). Often Mucinex can be purchased that contains not only guaifenesin, but other active ingredients (most commonly sudafed, benadryl, tylenol, and phenylephrine) that may help some of these other symptoms. So it may not be the Mucinex per se, but perhaps the benadryl ingredient that may be helping the runny nose. • Mucinex DM also contains dextromethorphan which is a mild cough suppressant. • Mucinex D also contains sudafed. • Mucinex Cold, Flu, and Sore Throat also contains tylenol, dextromethorphan, and phenylephrine. Phenylephrine is a nasal decongestant similar to sudafed. • Mucinex Night Time Cold and Flu also contains tylenol, phenylephrine, and benadryl. Personally, I dislike such combo medications as you may be taking a one or more medications which you may not actually need without even realizing it.